o its catalogue last Thursday, May 13. The green device has a powerful 20,000 mAH battery and even comes with 29 unique adapter tips giving you the capabilities to power just about any electronic you own. It's also very easy to use. All you need to do is put it in the sun to recharge and it can store battery power for when you need it. Next just set your voltage, place on any of the easy-to-swap adapter tips, and plug in! Apart from solar power, the battery can also be recharged by using the included AC Power Adapter or Car Cigarette Power Adapter, making it great power storage for any trip. The battery will take fewer than three hours to charge using the AC adapter and around eight to ten hours in direct sunlight. 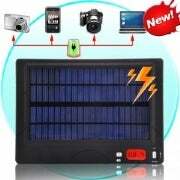 At $148.04, using the solar power daily to power your laptop you could easily save on your electricity bill.